, on page 97. Easy and delicious! 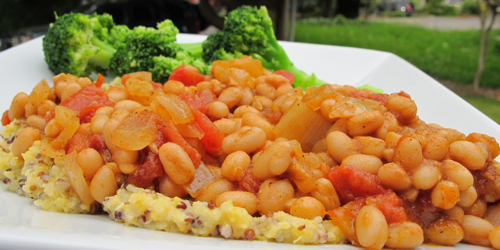 I served the beans over quinoa polenta, which I heated over low and mashed in ¼ cup unsweetened almond milk as it heated. Heat the oil in a large skillet over medium heat, add in the onion and cook till turning golden. Add the garlic and cook for a minute. Stir in everything else, turn up to medium-high and bring to a boil. Turn down to medium-low and cook uncovered for 20 minutes, stirring often, until thick. Serve over hot polenta or favorite starch.